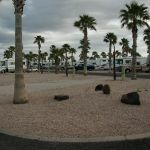 Ask fellow campers about "Saddle Mountain RV Park" and nearby attractions. Arrived late and used self check-in. Campground is primarily a snow bird location but they reserve 30 sites for over nighters. This was our second stay. Stayed here first in 2004. Wife needeed laundry facilities but they were secured by keycode. Would stay again as it is off the Interstate a couple of miles and very quiet. 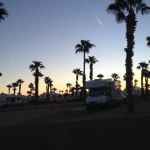 We camped at Saddle Mountain RV Park in a Truck Camper. There is nothing to do here - just an overnight stay. There a taco stand down by the highway that's pretty good. If you are feeling claustrophobic at the park you are staying at, you may consider this place. It is serene! Shopping is not nearby; it is about 22 miles away, but the views are amazing. There are a group of people who have side by sides and get together every Wednesday to ride into the mountains. They took me out the other day and it was awesome. Golf carts are welcome. Three major gas stations nearby with restaurants. Excellent Maintenance crews working everyday. 4-wheeling in the desert or nearby mountains, shopping in Buckeye for all you need. NOTE: nearest real shopping is 25 miles away in Buckeye. 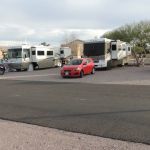 Are you affiliated with Saddle Mountain RV Park ?